Whether you're on wide hiking paths or steep mountain trails, the Eds Dynamic 28 Rucksack carries your kit for the day in comfort, regardless of the terrain. 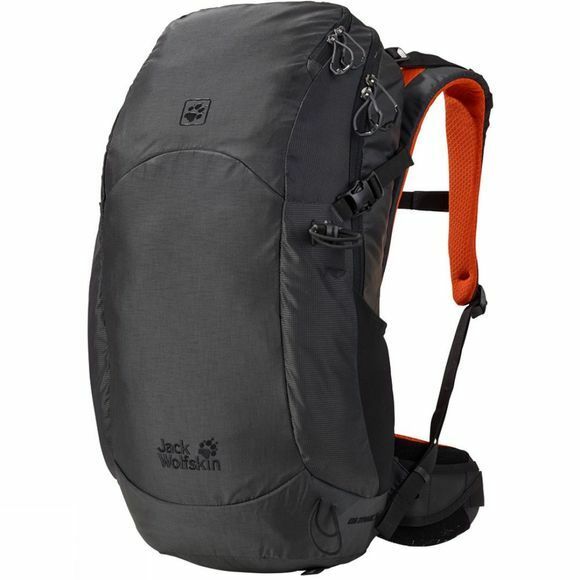 Thanks to Jack Wolfskin's Dynamically adjustable EDS suspension system, the flexible back padding and shoulder straps give you plenty of freedom of movement when hiking. You can adjust the straps on the move to adapt to the challenges posed by the terrain, whether you're scrambling up a steep slope or leaping across a stream. The detailing of the pack is super functional. Pack your general kit in the zipped main compartment and small items in the easy–access front pocket. The pack also has attachment options for trekking poles on the outside.